In recognition of World Asthma Day, here is ESA astronaut Alexander Gerst preparing to take preflight measurements for the Airway Monitoring experiment, which looks into inflammation of the airway. Developed by researchers at the Karolinska Institutet in Sweden, the Airway Monitoring experiment measures astronauts' breath to determine the health of their lungs. The potential findings will go towards developing better diagnostic tools for airway disease in patients on Earth. How does the experiment work? The analyser measures the amount of nitric oxide in exhaled air. Too much nitric oxide suggests inflammation. Causes can be environmental, like dust or pollution, or clinical, such as asthma – at least on Earth, but what happens in space? 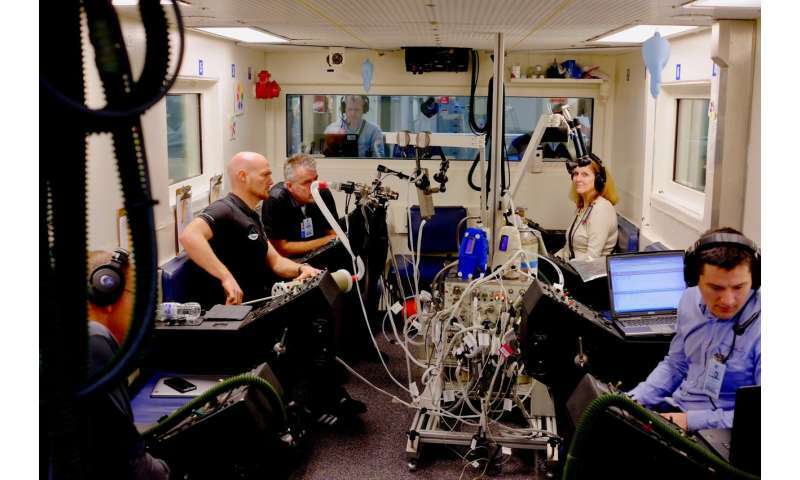 To find out, astronauts breathe into an analyser at normal pressure and then in the reduced pressure of the Quest airlock, which simulates the pressure of future habitats on Mars and lunar colonies. The measurements are then compared to the same reduced and ambient pressure data taken before flight to understand the effects of weightlessness on airway health. Can you spot the gloves hanging from the ceiling? They are handy low-tech visual indicators of air pressure. "The gloves give simple, low-tech feedback on the surrounding pressure and grow with increased altitude/reduced pressure," explains Principal Investigator Lars Karlsson. In space, astronauts are essentially fish out of water. Understanding how to track, diagnose and treat lung inflammation is important for their safety. The experiment draws on a study of airway inflammation that ran on the Station from 2005 to 2008. Preliminary results have been surprising. As expected, nitric oxide levels were lower when astronauts were in space, but they found that the levels initially decreased just before flight. Researchers are not yet sure why this is the case. If what is considered a normal level of nitric oxide in humans on Earth could, in fact, be a sign of airway inflammation for astronauts in space, then researchers have a more accurate standard to conduct further research on lung health in space. This information is key to ensuring the health and safety of astronauts on long missions taking them further from Earth. The experiment began with ESA astronaut Samantha Cristofretti's 2015 mission and measurements have been gathered by eight astronauts so far, including ESA astronaut Tim Peake, and soon Alexander. Alexander will hitch a ride to the Space Station in a Soyuz spacecraft in June for the six-month Horizons mission. Be sure to follow Alexander during his mission to see more on Airway Monitoring and other top science experiments planned for Horizons.